Villa Costa is the perfect choice for a romantic getaway in idyllic Greece. The hotel is for adults only, with no under 16s allowed and is available exclusively to Sovereign guests. It lies just 3.5 kilometres from the fishing village of Skala, one of the most authentic and tranquil areas of Kefalonia. Stroll through its streets lined with whitewashed tavernas, past craft shops and a chapel. The small family-run boutique has been recently refurbished and features eight chic rooms and suites. Each one has been named after a Greek goddess and boasts an individual design, beautiful furnishings, and balconies. Cool off in the outdoor pool with sunbathing area, whirlpool and views of the Ionian Sea, surrounded by shady, landscaped gardens. Guests can also enjoy a beach within walking distance, plus Potamaki Beach several miles away, which is a conservation area and nesting place for rare loggerhead turtles. Dine at Villa Costa’s gourmet restaurant, Sophia’s Terrace, which holds a weekly BBQ and wine tasting evening. Note that there’s a minimum stay of seven nights at this hotel. Guests staying in the Maia, Nausica, Chloe and Persephone rooms must arrive on Sunday, those in Hermione, Cassandra, Helene and Artemis can arrive on Tuesday. Children under the age of 16 years are not permitted at this hotel. This hotel has 8 rooms. Guests in Maia, Nausica, Chloe and Persephone must arrive on a Sunday and guests in Hermione, Cassandra, Helene and Artemis must arrive on a Tuesday. Please choose the day relevant to your chosen room when making your booking or checking availability. A minimum stay of 7 nights applies to all bookings. This stylish à la carte restaurant offers gourmet dining in stunning al fresco surroundings. 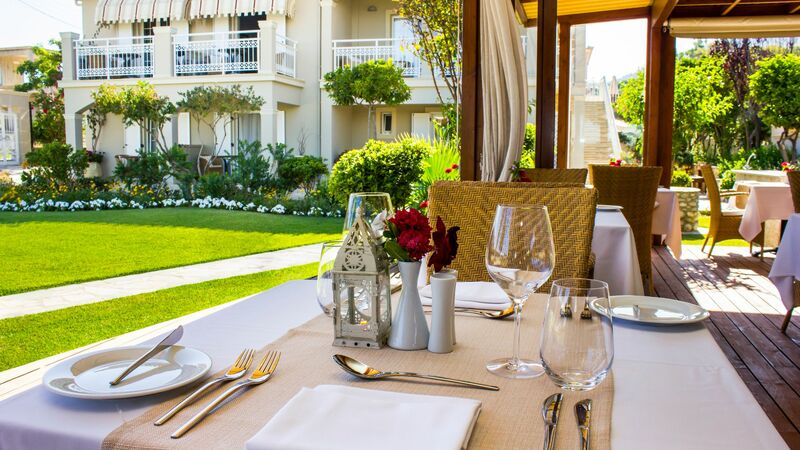 Soak up the garden views while feasting on rustic Greek cuisine, cooked with modern flair, and choose from the sumptuous wine list which includes local specialities. The menu features fresh salads and light snacks, as well as locally-caught fish and seafood dishes. Don’t miss the weekly barbecue and wine tasting evening, where you can discover the full scale of the hotel’s impressive wine cellar. Taste regional Greek wines paired with hors d’oeuvres, followed by a tasty barbecue on the hotel lawns. Meals at Sophia’s Terrace are included for bed and breakfast and half board guests. 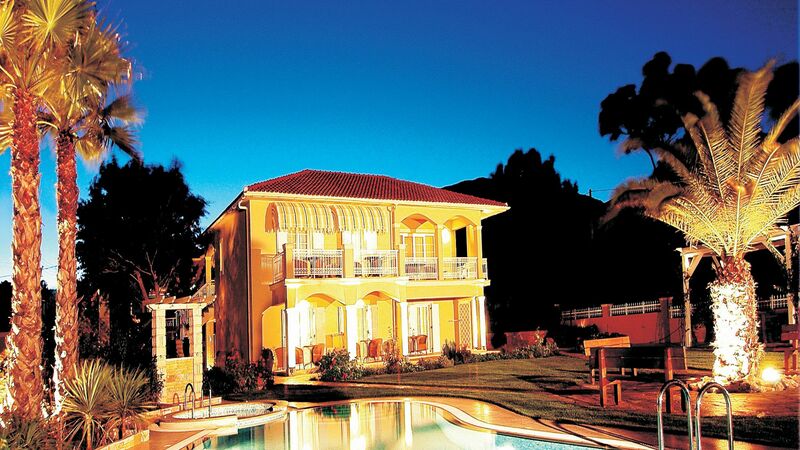 Villa Costa has a freshwater swimming pool, surrounded by a wooden deck with comfy sun loungers. Enjoy the sea views while cooling off and take a dip in the whirlpool. There’s a long sand and shingle beach within walking distance of Villa Costa. Head several miles further to Potamaki Beach, which is famous for its endangered loggerhead turtles and has soft sands and clear, topaz waters. Villa Costa has a tasteful reading lounge and conservatory for guests to relax in. Take a trip to nearby Potamaki Beach for a turtle-watching trip or take the mini train to sightsee around Skala. The hotel staff can arrange a variety of local boat trips for you to explore the area. Wine tasting with expert sommeliers is also available for small groups and couples. 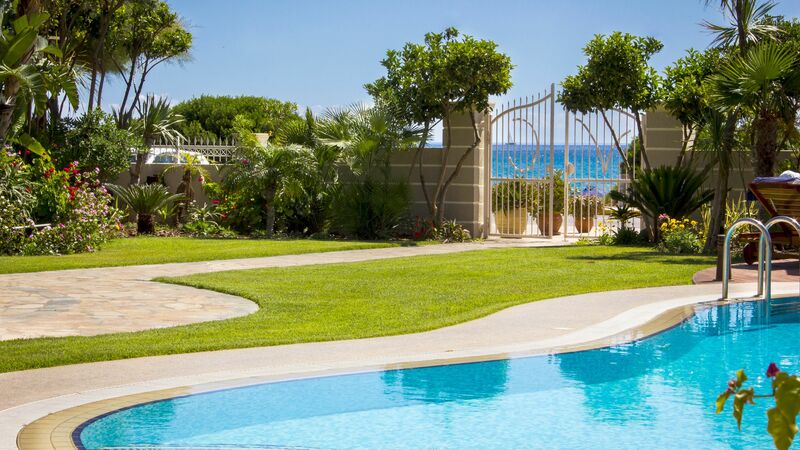 Villa Costa is located on the south east coast of Kefalonia, in the pretty outskirts of Skala. It’s right on the beach, making it perfect for those wanting to spend their days soaking up the sun and sinking into holiday mode. Skala itself is home to traditional family run restaurants where you can enjoy delicious traditional Greek cuisine, as well as chic cocktail bars ideal for a relaxing evening. If you prefer to explore, Kefalonia has a beautiful coastline which is peppered with little fishing villages. Sami is home to the beach which was featured in the film Captain Corelli’s Mandolin, as well as Drogarati Cave, which is said to date back 150 million years. Villa Costa is an hour’s drive from Kefalonia Airport. Maia is located on the ground floor and is decorated with elegant dark wood furniture and soft sand colour furnishings to give a warm ambiance. The room features a double bed and patio doors which open directly onto the gardens with a sea view. The changeover day is Sunday and the minimum stay is 7 nights. Cassandra is located on the ground floor and is decorated with soft blues and dark cherry stained furniture, offering a crisp and regal feel. The room offers twin beds, which can be made into double if required, and patio doors that open directly onto the gardens with sea view. The changeover day is Tuesday and the minimum stay is 7 nights. Hermione is located on the ground floor and offers luxurious, romantic accommodation with double bed, stencilled cabinets and soft tones. The patio doors lead to the gardens with a lovely sea view. The changeover day is Tuesday and the minimum stay is 7 nights. Nausica is located on the ground floor and has the benefit of a spacious private terrace with jasmine and lemon trees. It offers a double bed and is decorated in cool blue and white tones, using the motif from the Greek flag. The changeover day is Sunday and the minimum stay is 7 nights. Helene is located on the first floor and features a balcony with lovely sea views, double leather bed, Italian granite flooring and cool blue tiling in the shower room. The changeover day is Tuesday and the minimum stay is 7 nights. Persephone is located on the first floor and features twin beds, which can also be made into a double. It is decorated in calm and tranquil colours and offers a balcony with sea views as well as a shower room where turquoise green tiling is found with a contemporary sandblasted glass basin. The changeover day is Sunday and the minimum stay is 7 nights. Chloe is located on the first floor, luxuriously designed and colourfully decorated, offering stunning views of the mountains and sea. The changeover day is Sunday and a minimum stay is 7 nights. Artemis is a boutique-style room, located on the first floor, offering bespoke furnishings to create a luxury feel. The room has views of the sea and the bathroom includes a whirlpool Jacuzzi®. The changeover day is Tuesday and the minimum stay is 7 nights. Save 50% discount for holidays between 01 - 31 May, booked by 30 April 2019. Free Half Board for holidays between 01 May - 31 October 2019. Honeymoon couples will receive sparkling wine, honeymoon cake and flowers on arrival for holidays between 01 May - 31 October 2019. We were extremely lucky with the weather allowing us to spend time on the beach and around the pool. The hotel is a haven of peace, our room was stunning with a huge balcony and sea view with a spectacular sunrise in the morning. It was the last week of the season and the hotel was closing for the winter so a number of staff were leaving just after our arrival. This meant that the bar was not always attended and the menu was limited to one choice although Mario did offer to cook something else for my wife as she does not eat meat. We don't normally book half board as we like to explore local restaurants, we ate at Villa Cost for three evenings after which we chose to go into Skala and eat but were limited for choice as a lot of the restaurants had already closed for the season, but there were enough to enjoy. We would definitely go again as Mario and his team made us feel very special and the hotels location and cleanliness was outstanding. A very relaxing and enjoyable second visit to this lovely hotel. Beautiful gardens and relaxing atmosphere with superb service from all the vey friendly and experienced staff. Food is superb and varied. Exactly what you would want from a holiday. This hotel and island is now my all time favorite. The team here were superb Mario the owner is gentle and helpful. Teos oversees the restaurant and bar with charm and skill aided by his sister vasso. Now when I want breakfast at home I will shout vasso. Rooms are good standard and cleaned every day by agleta,not sure of spelling, but she does wonderful job. Pool is well maintained and grounds are beautiful. This is small hotel and dependent on the mix of guests most of whom were lovely but you can chose to mix or not. Mario's boat trip was excellent and so good we went twice and Ithaca was glorious. Mario is a wine buff and chose some superb wines for us at a reasonable cost. There are some superb beaches and mounda and katelious were our favourites. I want to return every year but my wife wants to try different places ,but she loved it and we will return.The hotel has a feature horse ferra who pokes his nose over the wall and loves being fed by guests. This was our 5th visit to Villa Costa, and once again we had a very relaxing holiday. The gardens and pool are extremely well kept, and the rooms are cleaned to a high standard every day. All the staff are fantastic and we are always welcomed back as old friends. Mario is welcoming and helpful, Theo, the loveliest guy and being the a major component, serving breakfast, dinner, drinks always with a smile, not forgetting Vaso who is always smiling and Sophia, Mario's mother who still keeps a check on everything. The atmosphere is friendly, so you do get to socialise and chat with other guests, however you can still have your own space if you prefer. Obviously as Villa Costa is small, only 8 rooms, the evening menu is limited but there is always a choice, the food was fresh, cooked to order, of a high quality and delicious. Mario's boat trips to Ithaca are brilliant, followed by fabulous lunch at Anti Samos, ending with a swim in clear waters at one of Kefalonias isolated beaches. Although the guests tend to be of a certain age, our two nieces who are 20 and 22, joined us for a week again, they came last year, and once again thoroughly enjoyed everything about the holiday. In fact we have all booked again for 2019.